Once we have received your completed registration form, we will contact you to invite you to make a plasma donation, according to your availability. Plasma is the liquid component of blood that contains three types of cells: red blood cells, white blood cells and platelets. It makes up 55% of the total volume of blood. It is a yellow liquid made up 90% water and it is rich in proteins such as albumin, clotting factors, immunoglobulins and fibrinogen. Plasma is used to manufacture medications for people with deficient immune systems, as well as to treat many other diseases. The term "apheresis" refers to a blood collection technique that collects only the desired component(s). Thus, during a plasma apheresis donation, the donor's blood goes through a machine that separates the plasma from the other blood components. The plasma is collected in a pouch and the other components are returned to the donor. Why give plasma through apheresis? An apheresis donation is a targeted way of responding to the demand for plasma, which is growing rapidly. This procedure collects twice as large a volume of plasma as during a whole blood donation, thereby maximizing each donation. Plasma can be donated every six days. Plasma donation: what to expect? 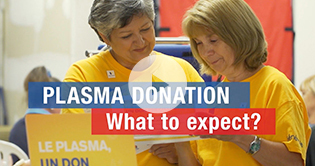 Plasma donation: what happens after? Height and weight restrictions apply for plasma donors.